For a limited time, the most accurate precision barrels to hit the airsoft market are back! 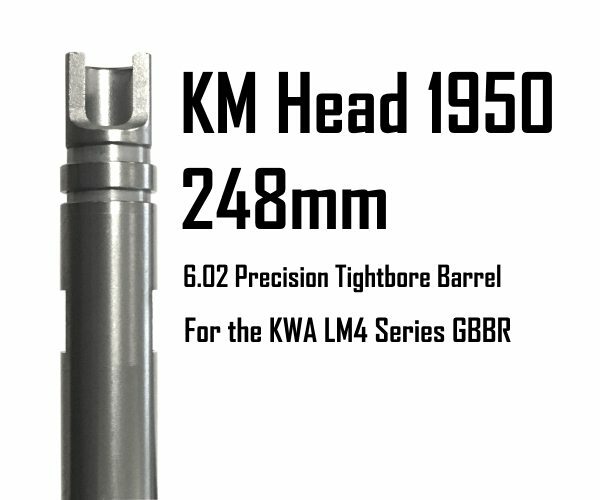 KM Japan’s Head 1950 inner barrels are manufactured to the absolute highest tolerances found in a tightbore, and are Teflon coated to ensure a smooth, consistent travel surface for your BBs. This 248mm long inner barrel will directly replace the gas KWA LM4C inner barrel, or can be used in a custom PDW/CQB build. *Please note that some modification may be required to install this part. Returns/exchanges are not accepted for parts. Please ensure that this barrel will fit the desired application. KWA recommends having a professional gas airsoft technician install this barrel. The picture in the listing displays the actual cut of the of barrel you will receive.